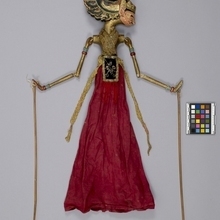 Javanese puppetry as an art form probably developed by the 11th century. 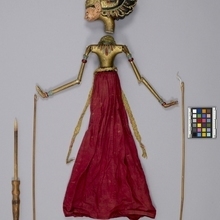 The three-dimensional wooden wayang golek puppets of western Java appeared during the 16th century. Originally the plays depicted Javanese mythology, but after the Indian conquest of Java the Hindu epics, Ramayana and Mahabharata, were incorporated into the cycles, which comprise about 200 plays. An individual or group hires a dalang (puppet-master) to celebrate important occasions. The performances often last all night and are generally presented in three acts, with vocal and instrumental accompaniment. The individual plays vary widely in detail but usually involve conflict between good and evil. They serve a moral and religious purpose, and more recently, one of political commentary. Each puppet's character is represented by its appearance and placement onstage; protagonists with strong elements of good are placed to the right, antagonists of violent or evil nature to the left. Satria Gondrong is an ideal warrior; the evident hair earns him the nickname of "knight of the long hair". Known for his loyalty, faith in the code of honour, and courage, he is a popular character who appears in most sets. Puppet features many traits indicating quality, nobility, and spirituality. Pale face, fine facial features show beauty and good nature. Elements of headdress reflect high birth. Rich clothing and ornaments further display the character's importance. These features indicate the puppet portrays the character of Satria Gondrong.